The world of trade show graphics is brimming with innovative new options and displays. Your trade show display can be a three-dimensional ad telling your prospects who you are and what you have to offer. Bold, inviting trade show graphics cut through the clutter and bring you more prospects than a traditional booth. We have the capabilities to produce extraordinary full-color, photo-quality trade show displays that really stand out. With our fast turnaround times, even trade show presentations that have to be prepared in a hurry can have a lasting, professional impact. 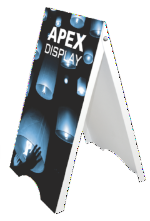 Highlight special offers or promotions with banners or customized signs at your booth—we print and deliver those too. See our trade show display website to get a better idea of our capabilities. It can be difficult to stand out from the crowd and separate yourself from your competition—customized signs and banners can make a big difference in generating the amount of awareness your business needs to succeed. Printech has been providing high-quality vinyl banners and custom signs to businesses and nonprofits throughout Flemington, Clinton, Frenchtown, Readington Township and East Amwell Township for years. Rest assured, our professional staff will work collaboratively with you to create exactly what you need to cut through the clutter. Professional signage and custom vinyl banners are one of the most effective—and affordable—ways to promote your business, booth or charity event. Don’t wait any longer; make a lasting first impression with your own customized signs or banners today. We’re ready to work with you from concept to creation to develop the perfect sign—give us a call or stop by today!